FROM THE AUSTRALIAN OPEN – No. 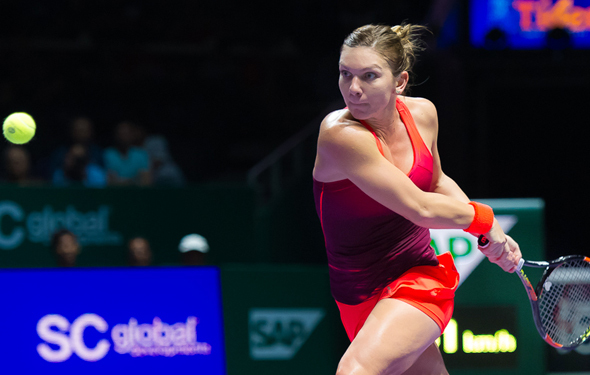 1 Simon Halep, who won the 2018 French Open, began to get hurt during October, and she had to pull out for the rest of the year. In the first round at the Australian Open, she beat Kaia Kanepi 6-7, 6-4, 6-2. Even though last year she was thrilled that she finally won a Grand Slam at the French Open, still, as she said, “There is nothing to lose,” because her health is not 100 percent — yet. The Romanian won the Canadian Open, beating Sloane Stephens in the final. The next week, she reached the final in Cincinnati, finally losing against Kiki Bertens. She lost, but it is almost impossible to win two huge events, two weeks in a row, because it was in August and it was darn hot outside. Her body began to struggle. She was sore, she was hurt, there was some pain. She began to struggle, losing in the first round of the US Open. In Beijing, she had to retire. She pulled out and she couldn’t play for the rest of the year. Gradually, in December, she began to practice and hit some balls. Slowly. Finally, was ready to play again. While Halep has won 18 titles, it took her 10 years to grab a major. She was close at the Grand Slams, but in the second weeks, she would back off. Last year in the Australian Open, in the final, she lost to Caro Wozniacki 6-4 in the third. Last June at Roland Garros, she finally achieved it, beating Stephens in the final. Even though she wore down towards the end of the year, now Halep feels more comfort.